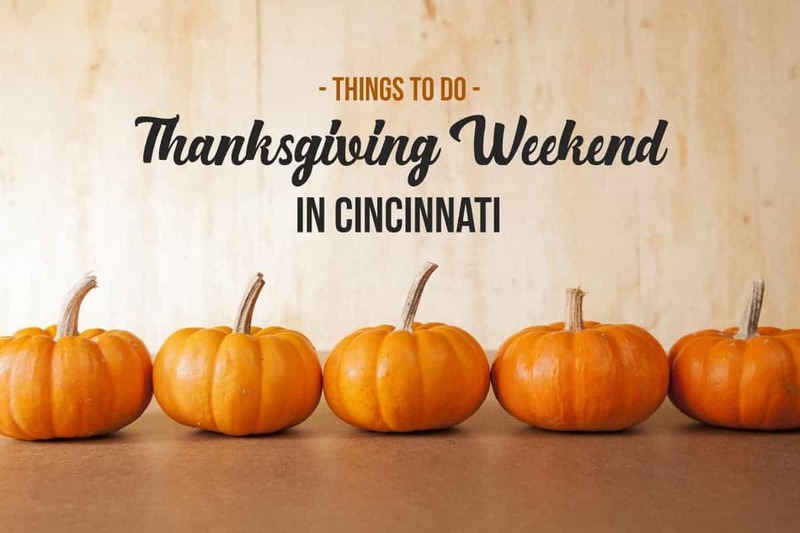 If you’re looking for something to do for the 2018 Thanksgiving Day weekend in Cincinnati, we’ve got you covered! Whether you have family in town, you’re visiting for the weekend, or you simply have a few days off of work, you’ll enjoy this list of events for Thanksgiving weekend. The following events are date specific. Don’t miss our list of Holiday Events that go on all weekend – find it after the dated events. Santa arrives at Cincinnati Museum Center! Festivities begin at 11 a.m. Santa will arrive by helicopter, weather permitting, around 11:50 a.m., with a special celebration at noon! Hometown Holidays in Milford in downtown Milford. This annual family friendly event, which is free and open to the public, will feature a variety of holiday happenings along the four block Main Street (U.S. Route 50) historic district of Milford, Ohio 45150. Bagels with Santa, happening at Fountain Square (in the warming tent), registration required. Take the kids to see Santa at Washington Park as part of their “Santa’s Workshop“, 1-3pm. Macy’s Downtown Dazzle. See Santa and his friends rappel down the side of the Huntington Bank Center to the Fountain Place rooftop, followed by a spectacular fireworks display! Santa will be at the Carew Tower along with Mrs. Claus. Enjoy free rides on the Cincinnati Bell Connector on Friday Nov. 23 and Saturday, Nov. 24 (with carolers on the streetcar). Westside Holiday Market at Westside Market, 5-9pm. This outdoor Holiday themed event will have carolers, Santa, hot cocoa and bonfires. Enjoy local brews from West Side Brewing, over 80 talented local vendors, food trucks, baked goods, kid friendly activities and so much more! Holiday Season Kickoff at the Taft Museum of Art. Enjoy free activities for the whole family. The house will be decorated inside and out with lights, garlands, and displays of antique ornaments on old-fashioned feather trees. 11:15am – 4pm. Polar Express and Holiday Storytime at Behringer-Crawford Museum. Local children’s librarians will read the children’s books “The Polar Express” and “The Holiday Adventures of Wiley Wahoo & Me!” Children can create a Christmas craft and enjoy hot chocolate and cookies. 2-5pm. Reservations are required. Holiday Junction at Cincinnati Museum Center: Nov. 17 – Jan. 27; Come experience a deep-rooted Cincinnati holiday tradition: Holiday Junction Featuring the Duke Energy Holiday Trains. The exhibition, a display of hundreds of model trains zipping around a winter wonderland, has been a part of Cincinnati holidays since 1946. Now you can gain a new perspective: peer over the Duke Energy Holiday Train’s snow-capped neighborhoods with a bird’s eye view of the historic layouts. Take a snowy walk and build a snowman under the mesmerizing northern lights. Walk among a blizzard of bricks in a custom-built LEGO wonderland. Antique Christmas at the Taft Museum of Art: Nov. 2 – Jan. 6; Escape to a winter wonderland of Christmas past at the Taft’s annual display of antique ornaments, decorations, and toys. Holiday Lights on the Hill at Pyramid Hill Sculpture Park, Nov. 16 – Jan. 1; Hours: Mon-Thurs, 6-9pm ($20/car) and Fri, Sat, Sun 6-10pm ($25/car); Members are $15 any day. Thanks for the convenient list! So excited! Thank you for organizing this amazing list! There will be a drive-thru light display at Coney Island, called Christmas Night of Lights beginning this weekend through Jan 1! Thank you for putting things together. I have found your site the easiest place to find things to do. Bless you!